It's so easy at weddings to overlook small details. After all, so much choice and decision making goes into everything when it comes to weddings, and the choice of wedding ring or band is one area that a great deal of thought usually goes in to. There are off course, the boring old contrived ways of photographing the wedding rings. Bride and groom, with one hand over the other, in a pose that no two humans would ever do naturally. It looks awkward and forced because it is awkward and forced. I prefer to photograph the wedding rings on the morning of the wedding, before anyone is even wearing them. This allows the rings to shine (excuse the pun) in the image. 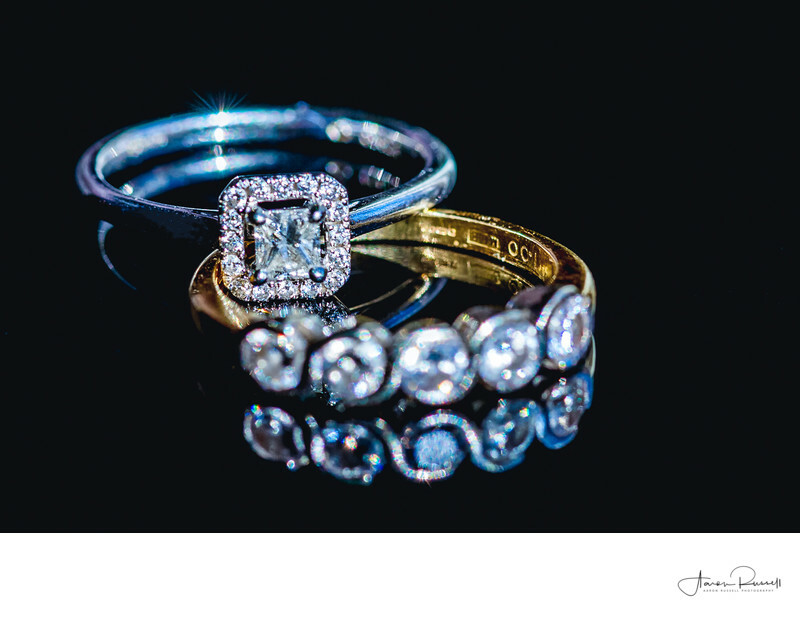 Gone are the close-ups of a bride and grooms hand - this is a really pure way of photographing just the wedding rings and making sure they stand out in the image as they should. For this image I placed the bride's engagement and wedding rings on a glossy black table top, knowing well that if I was careful with where and how I placed my light source, I could create and image where it would appear that the rings are floating in blackness. For this photo I used a Westcott ICE light.